The innovation and capability of Australia’s National Critical Care and Trauma Response Centre (NCCTRC) has been shared with more than 300 representatives from 65 countries. Staff from the NCCTRC stepped onto the world stage sharing their experiences, innovations and response capability to sudden onset disaster at the Emergency Medical Teams (EMT) Global Meeting in Hong Kong, hosted by the World Health Organisation (WHO). These areas included rehabilitation, water, waste management, the setting up of a field hospital and quality assurance. 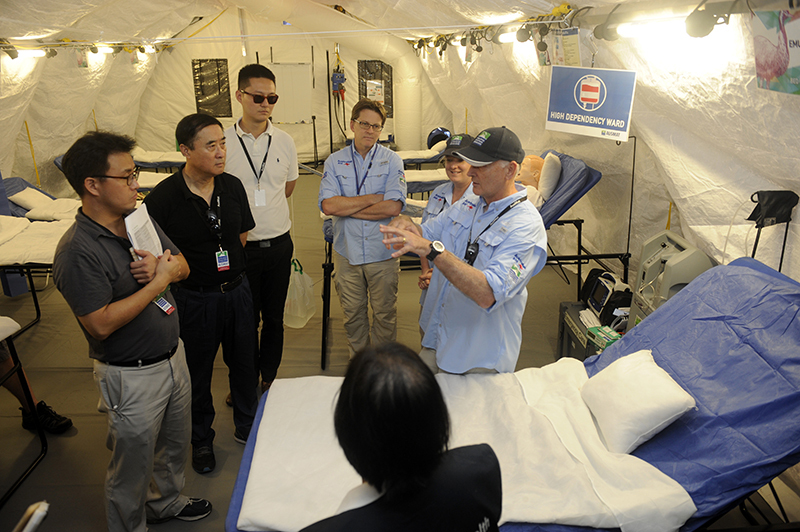 The team also helped facilitate workshops in field hospital site selection and media management. The three day meeting in late November followed the successful global verification of the Australian Medical Assistance Team (AUSMAT) in Darwin in October, which saw the team credentialled as an EMT Type 2 by the World Health Organisation. The classification is standardised ensuring that each team worldwide is defined by specific requirements such as the number of outpatient treatment or surgical procedures that must be performed per day and the skills and services that must be provided to the number of operating theatres and bed numbers. All teams must be self-sufficient, responsible for their own equipment, maintenance and supplies so they are not a burden on the disaster-affected community. The AUSMAT joins Japan, Russia, China and Israel in being globally verified, with a further 75 teams worldwide preparing for verification. The NCCTRC is funded by the Australian Government and was established following the 2002 Bali bombings.